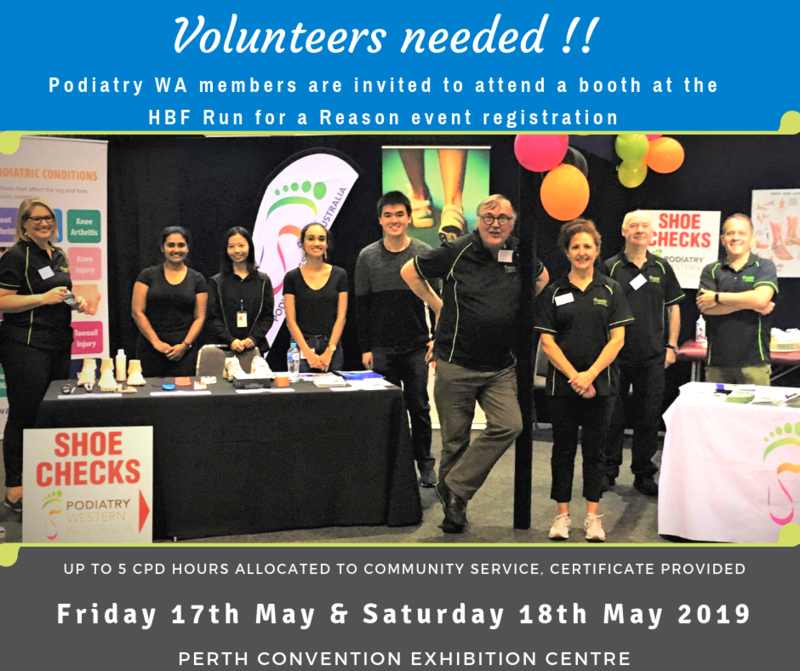 This year the HBF Run For A Reason volunteer event is once again being supported by Podiatry WA. We will be taking part in the two day lead up to the run, as well as entering a team on the day. PMSS Students who are members with Podiatry WA are invited to attend. Please register and select a suitable time. When you will be needed? We will be looking at a morning shift and an afternoon shift. Podiatry WA will be in the integrated health & wellness space where we expect 20,000 people to pass through. Register your interest immediately to give us an indication of whether or not you would be able to help out. Choose the time block that suits you. We will then be in contact with you when we draw up the volunteer roster and we can tailor your shift to your requirements. What will you be promoting? Volunteering your time can be counted towards your annual CPD requirements for AHPRA registration (up to 5 hours) so it's not only good for you, it's good for your registration!